Determine quickly if a prospect is a good fit for your agency. You can spend so much time going to lunches, vetting questions over the phone, writing up emails, doing research, and creating a proposal only to have the prospect say, "Thanks, but no thanks." If you even get a "no," consider yourself lucky. Most prospective clients simply disappear. But if you review your interactions — if you're honest — you know that the prospect wasn't a good fit. If only you had asked the right questions earlier, you would have realized the client didn't have the budget and wasn't committed to changing their marketing plans. You need an easy way to qualify clients and determine if prospects are the right fit for your services and way of doing business. That's why we created this client intake form. 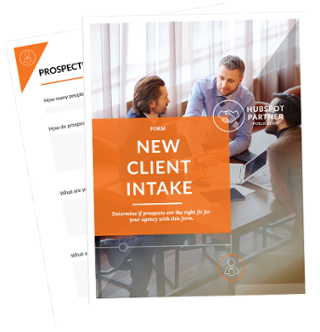 Use it to determine if the prospect aligns with your ideal client profile and is likely to result in a profitable, long-lasting relationship.